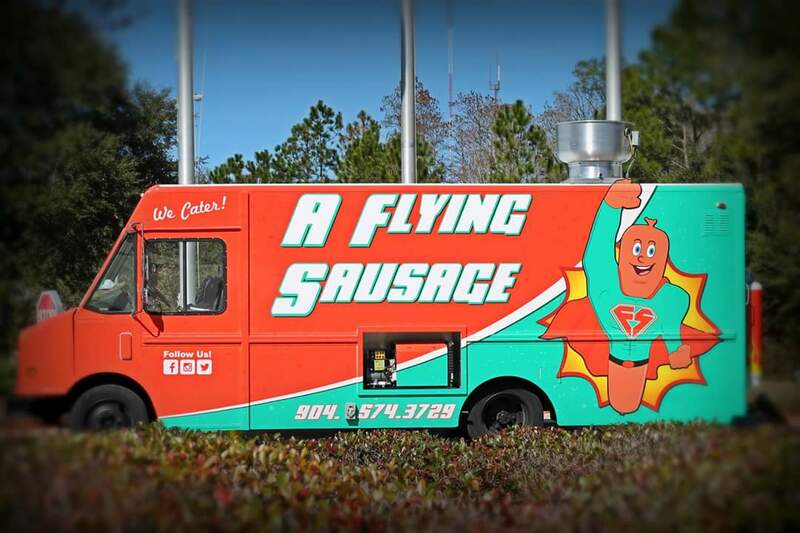 A Flying Sausage has officially launched!!! 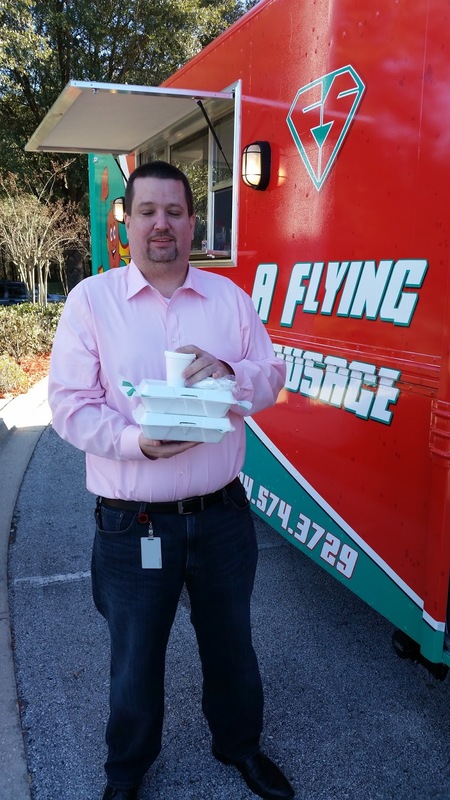 Wednesday, February 10 was our very first event at 121 Financial Credit Union for breakfast and lunch. I had to drop the kids off at school before I could meet Thomas out at the location, which meant he had to get everything packed up and ready to go on his own. He got up hours before dawn to make sure he had time to get everything on the truck and ready to go. I got the girls to school and headed over to 121, and actually ended up beating the truck there. I stood outside and waited, scanning the road eagerly for my first sighting of our truck on the move. All of a sudden, I saw it pull up to the light. Words cannot even begin to explain the overwhelming excitement and pride at seeing OUR truck driving towards me! We worked together to get everything all set up and ready for service, and we were just about finished when we had our first customer!! This is Dave, and he ordered our Biscuits and Gravy, which he loved so much that he came back and ordered again for lunch. He graciously let us take his picture and agreed we could post it to remember our first ever paying customer by. We appreciate the friends and other food truckies that came out to support us on our first day! 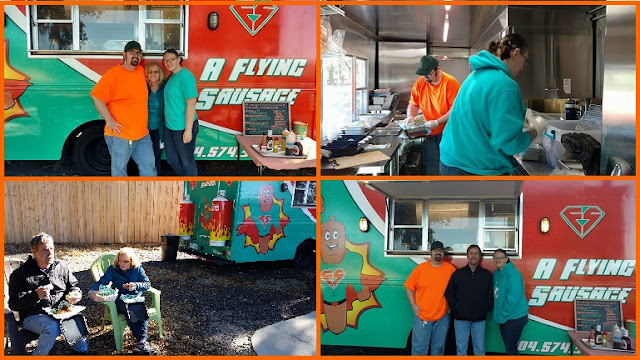 It was FREEZING and exceptionally windy, so we were even more grateful to those that braved the weather to come see us.Our good friends from Tikiz came out to check us out and Virginia Hocking took some amazing photos for us. 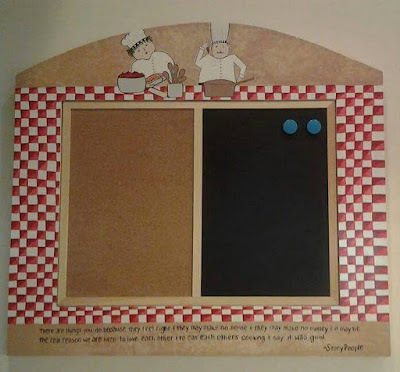 I am so thankful that she did, because even though I took some photos of the truck, they weren't nearly the quality that she was able to achieve, and I forgot to take a picture of the menu board! There were a couple of hiccups along the way, but we expected that as we learn the best way to run OUR truck. Overall, things went relatively smoothly, and we received some rave reviews on the food, and a surge of Facebook followers. We headed back to the shop and got things cleaned up, and reveled shortly in our first day bliss before crashing, exhausted, into bed so we could get up and start prep for Saturday's event. 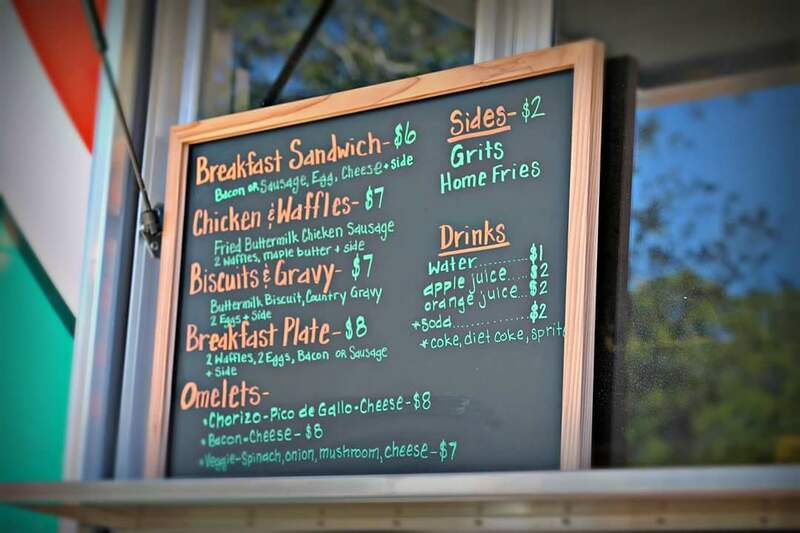 We were scheduled to go out to Jacksonville University to feed those attending a Lacrosse Tournament starting at noon. We were told it was going to be a massive event, so we prepped accordingly. We scheduled an extra helper since we anticipated such high numbers. We were up before the sun to get everything set, and that seemed to go more smoothly this time around. We got to the event and got ready to serve. It was still very chilly and windy, but it lacked the bite that Wednesday had. The concession stand was open, which we found out later was not what was agreed upon when they booked the event with the organization we received the lead through. Things were much slower than we had thought it was going to be, so we let our helper go in the early afternoon. Thomas' mom and stepdad made the 5 hour drive to come see us in action for a couple of hours, and we were able to feed them. It was so wonderful to see them and to show them what all their support has led up to. We wrapped it up around 6pm, and headed back to the shop to clean up. It wasn't what we had expected, but we were still happy with the numbers we did, and those that we were able to feed. We especially loved the older woman driving down the road on a scooter who waved so excitedly at us as we drove by. Our next event was Tuesday at FSCJ North Campus. We were told ahead of time that these are college kids who can't necessarily afford the higher priced items, so we dropped the entrees to include two sausages instead of three and lowered our menu prices. We got there for breakfast and immediately had a surge of people. They seemed to show up in waves between classes, and we had a steady ebb and flow the whole time we were there. We got to feed a round of the culinary students, which was very exciting for us. One of the girls actually just got her first job, and it is on a food truck, so she was very giddy to get to try us. Our prices were still a little higher than the other two trucks who were there that day, but that didn't seem to slow people down. 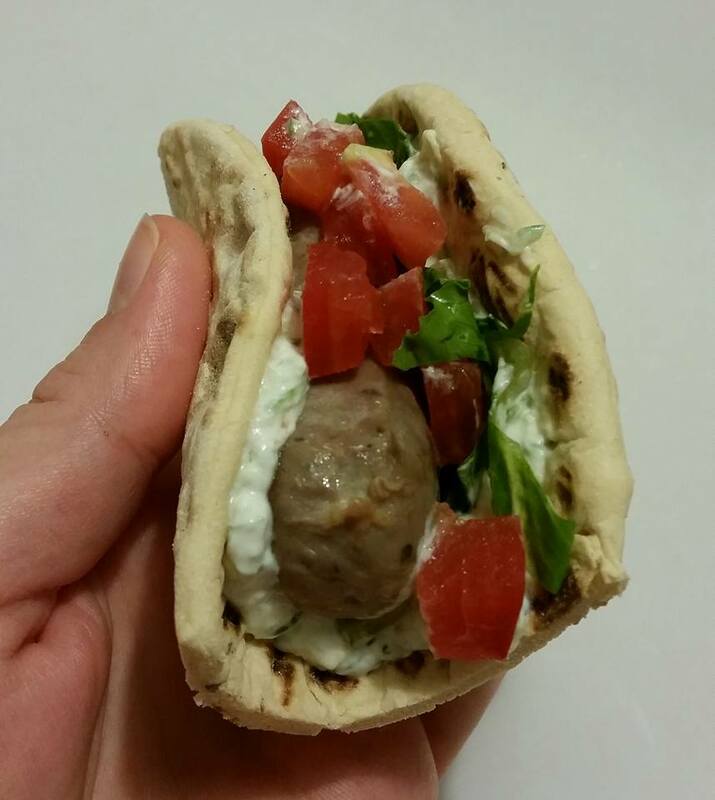 One of our biggest sellers that day was actually our highest priced menu item, the Lamb Gyro, which is served on our homemade garlic rosemary flatbread! We were very encouraged by the numbers we had, and we are definitely looking forward to going back this coming Tuesday. We seem to be getting into the rhythm of the truck, and we are able to get our food out quickly, which has always been one of our goals. We were surprised by one of our best friends showing up to this event and we were so excited to feed them! We were so thankful they made the drive all the way out to see us on the Northside!! Overall, we are learning quickly, getting things situated, and starting to get a feel for how much we need to prep of what items. Like any new business, it is long hours and little sleep, but we know it is going to be worth it! Thomas has his last day at his "normal" job on Sunday, and then we will both be working the truck full time. We have a few more events through the end of February, and then the calendar for March is bursting with almost back to back events! We are so excited to feed Jacksonville, so check our Facebook page for consistent updates on where we are so we can feed YOU! It has been quite awhile since I've updated for quite a few reasons. We hit several bumps in the road, which was to be expected, but no less frustrating. November was spent watching the truck be renovated. The building out of the truck reached a point where we were waiting...and waiting...and waiting on our hood vents to arrive. The holidays really slowed things down and what we thought was going to be a December 5 open date, got pushed back further and further. In the meantime, we tested recipes. Finally the hoods arrived and were installed, and we could begin the wrap process! 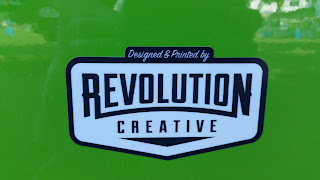 The guys over at Revolution took their time and made sure everything was absolutely perfect! We LOVE how it turned out, and it was exactly what we wanted! We were inspected by the state on Wednesday, and began jumping through all the hoops to get licensed with the city. That ended up being a much longer and more complicated process than we were expecting due to some changes in the insurance that they accept. We are now working on untangling all those snarls, but have it figured out and are waiting on the final forms to be approved by Ms. Wanda down at City Hall. As soon as we get the email that the wording is all perfect, we can go sign on the line and it should be simple from there. We are on the runway, waiting for the all clear to take off! Keep your eye on the sky Wednesday, February 10 for our maiden flight! Find us on Facebook to stay up to date on where we will be! How much can happen in one week? This week has flown by, and so much has happened since our last post! 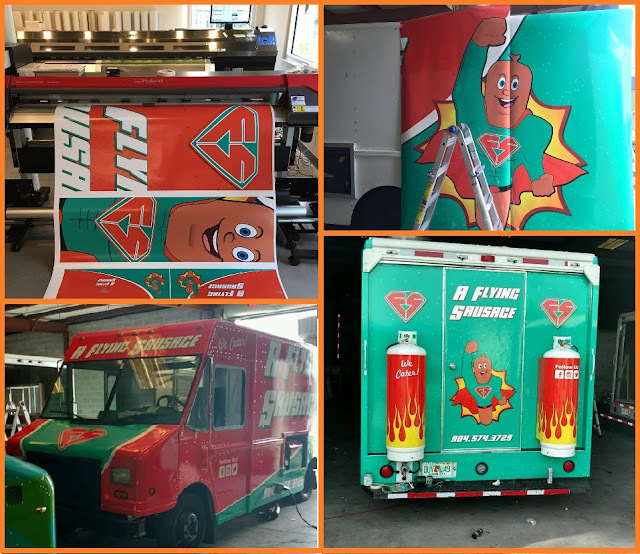 We received equipment and tested some recipes, met with our graphic design company to begin work on our logo and truck wrap design, and worked our first event to get some training. We are exhausted, but it is one of those amazingly satisfying kinds of exhausted. Our equipment started arriving on Thursday the 22nd. We were like kids on Christmas morning when we pulled up to the house and saw the box on the porch! 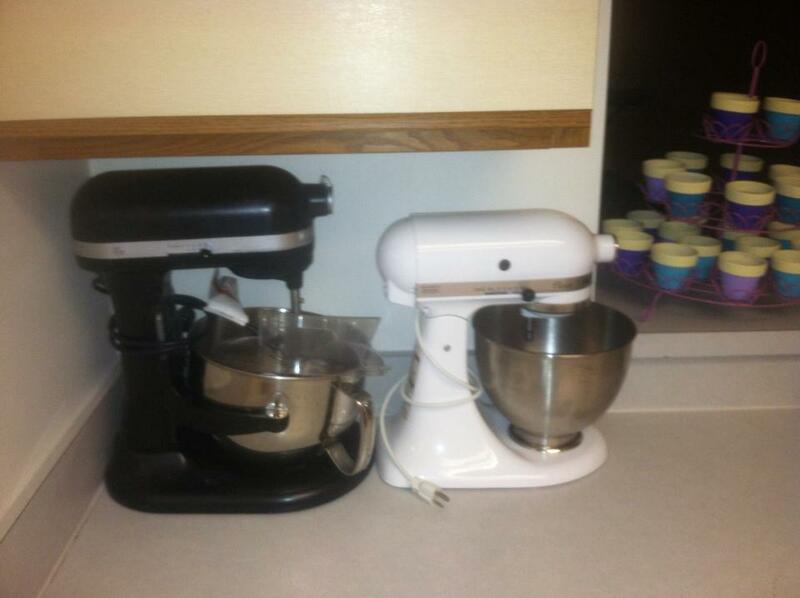 Our stuffer had arrived and our Foodsaver wasn't far behind. We went and got a planner so we can keep track of all the events we are starting to book (we have been informed that we MAY have our debut at The Big Ticket on December 6th!). 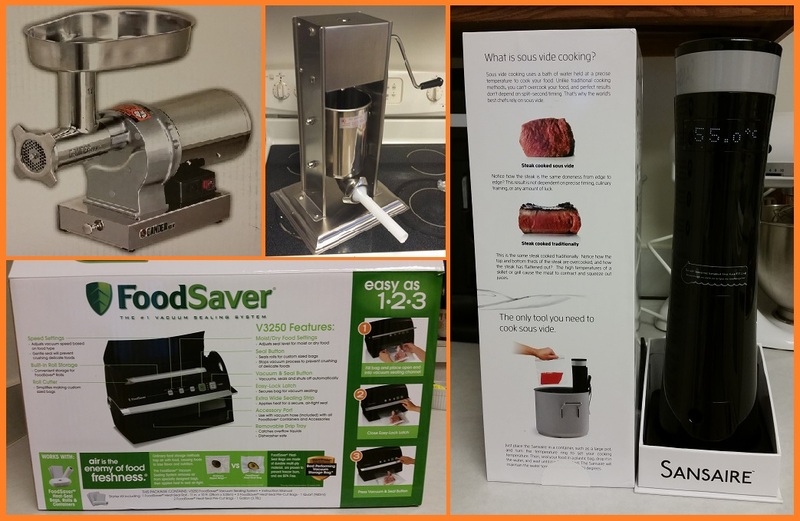 Next our immersion circulator showed up, and then our grinder! 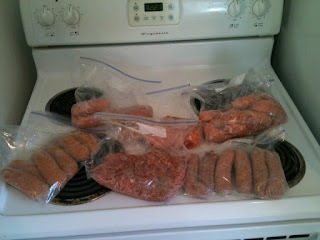 We have everything we need to begin testing our sausage recipes as we will prepare them for the truck! We were on pins and needles waiting for Wednesday to arrive so we could meet with our graphic design company. 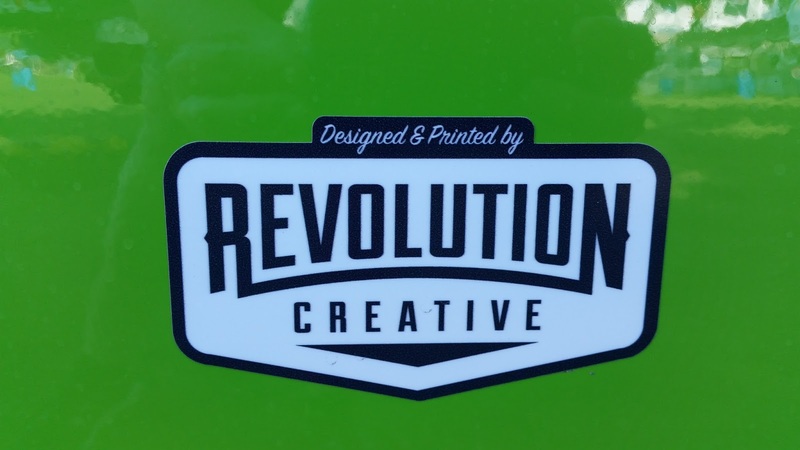 We are working with Revolution Creative who wraps food trucks exclusively for Tom and Jen of A Hot Mess. 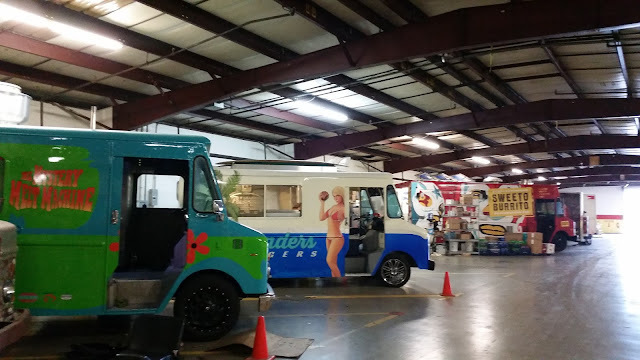 The truck we worked on Friday evening, The Mystery Melt Machine, was created by Revolution Creative. 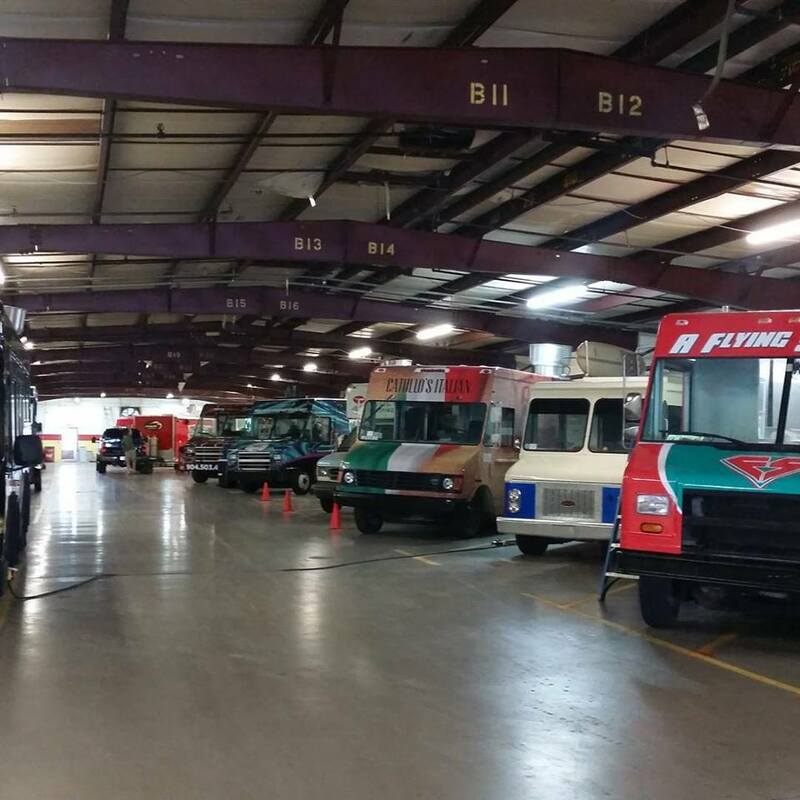 They do some INCREDIBLE work, not only for food trucks, but in all sorts of facets. We could not be more excited to be working with them. Immediately upon meeting George, we were at ease and felt a connection with him and the company. He had some wonderful ideas, and took our ideas to a whole new level. They are going to be an integral part of helping us successfully brand A Flying Sausage. We will be meeting with them again towards the end of this upcoming week to see what they have come up with for our truck and our logo! 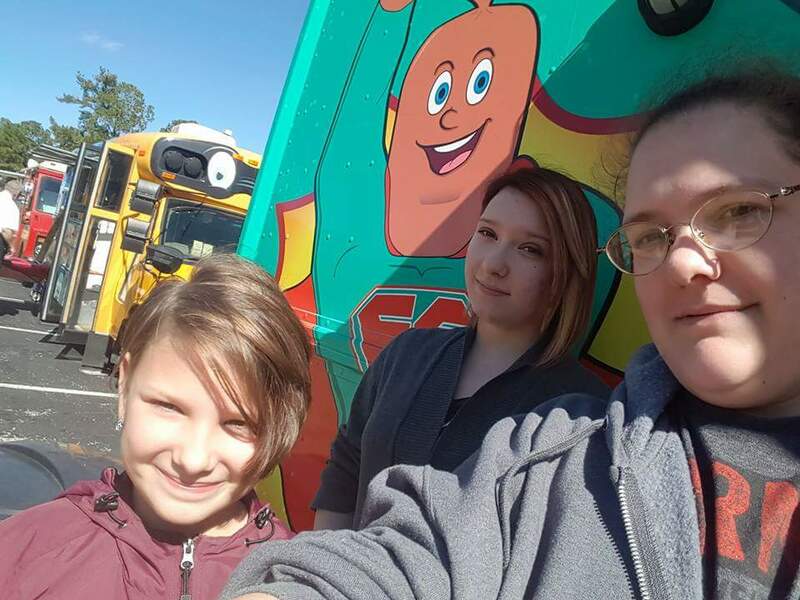 We knew we were going to be working on The Mystery Melt Machine on Friday to get some training on a food truck in, but we found out on Wednesday that we were working Tailgate 2015. This is a concert held at Metropolitan Park for FL/GA weekend, which is one of the biggest events in Jacksonville. Thomas seemed to take this news in stride, whereas I started to get a little excited (cough...anxious). This was a HUGE event for us to work with literally NO TRAINING until a couple of hours before the event. Tom and Jen's confidence in us was reassuring, yet a little terrifying. They have been SO incredible, and we did NOT want to let them down! Thomas and I both were scheduled to work the morning shift at our full time jobs on Friday, and then we were headed straight to Met Park to find the trucks and jump in. We had goosebumps the entire walk from the car into the event, and coming over the hill upon the trucks. When we got there, things were a little slower than we thought they were going to be, but as soon as Tom arrived, things kicked into high gear! 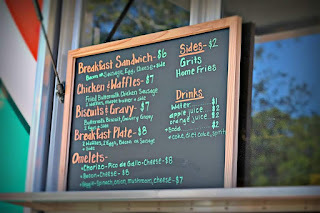 We jumped in on prep, learned the menu, and got the truck set to do service as people began to arrive. Pretty soon we had a line of people and were cranking out food while jamming to some incredible tunes. Tom came to check on us a few times, and jumped in to help at one point (at the perfect time!) for about 5 minutes, but other than that, we did it on our own! We got down a system that worked for this event, and not only made it through the event, but had a BLAST doing it! Once The Band Perry hit the stage, things slowed down dramatically and Thomas was able to step out of the truck for a moment to take a breath and hear some of the music. How amazing to get to do what you love and not only get to see an incredible show for free, but to actually get PAID to do it! I don't know about Thomas, but I'm already antsy to jump back on a truck and help with another event! At the end of the event, Tom came by and said that we did a fantastic job, and that he was going to do his best to get us into The Big Ticket on December 6, also at Met Park...in OUR truck!!! It would be mind blowing to have our debut as A Flying Sausage be at such a massive event! 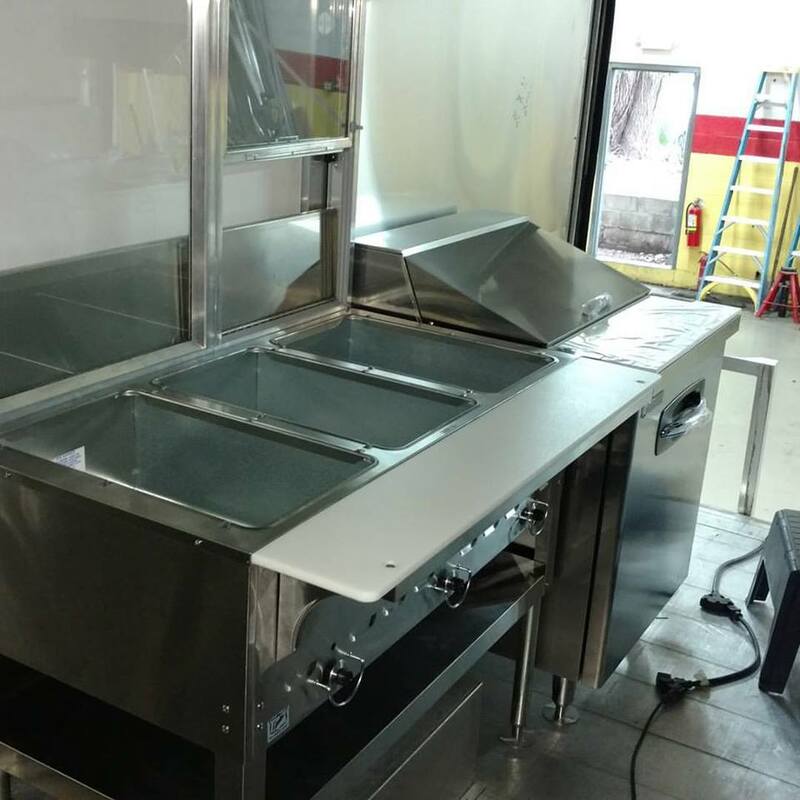 We have a couple of other events already booked for the truck, and we are working our tails off to get all our recipes perfected before we open our doors! 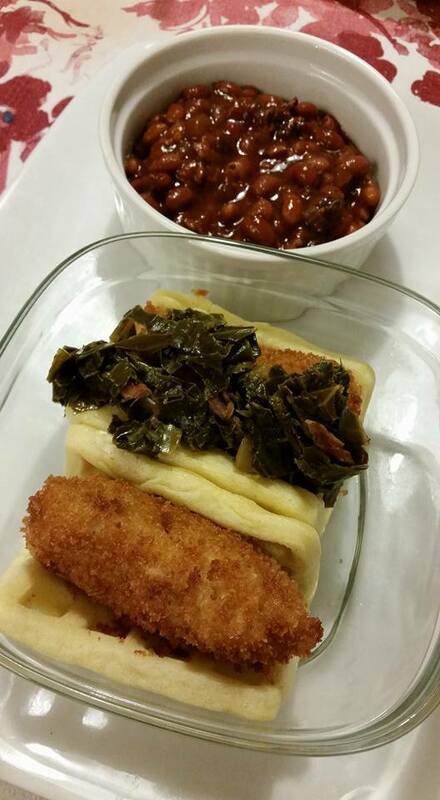 Pictures will be coming SOON of the food, so keep checking back! We only have 15 days to go in our Kickstarter Campaign, and we are a LONG ways from our goal! Please, please keep sharing and if you haven't already made your pledge, please don't wait! We have had some generous donations and would like to say thank you SO MUCH to those that have jumped on board so quickly, and have tirelessly been sharing our Facebook page, our Kickstarter Campaign, and our Blog Entries! You guys are marvelous and we are deeply humbled by the love you are showing us! Click here to join our Kickstarter Campaign! Things are starting to take off! Monday was an incredibly huge day for A Flying Sausage! The bank wasn't going to be ready until 4pm on Monday, so starting Sunday evening, we were counting down the hours. "19 hours to go!" Monday morning, we woke up and the first thing out of our mouths was a current count on how many hours were left. Throughout the day, we were texting with each other, and the butterflies were growing. 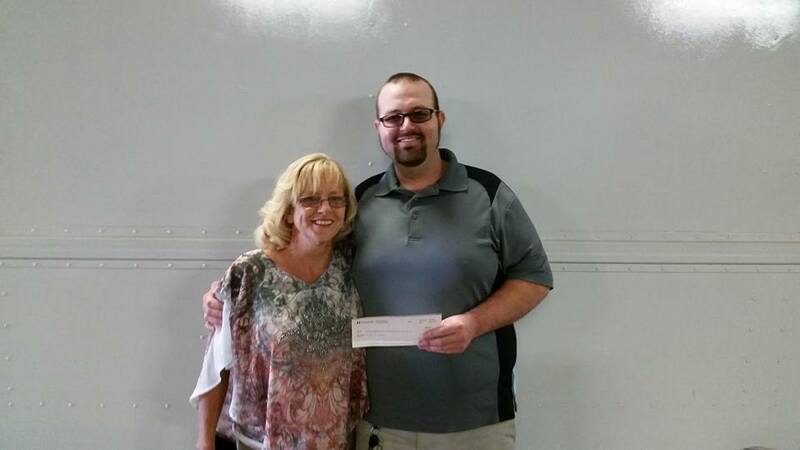 We had to have insurance on the truck before we could sign the loan, so Thomas got that all taken care of. Finally, it was time! The I's were dotted and the T's were crossed, and we had a check in our hands! We were SO EXCITED!!!! We flew over to A Hot Mess Food Trucks to hand the check to Tom. The truck is ours, our equipment is being ordered, and this is REAL FOLKS!! (Insert happy scream here) We are set up to go work on one of his trucks next weekend so we can get our feet wet by getting a feel for how a truck is different than working on the line at a restaurant. We will also be meeting with the graphic artist in the very near future to get our logo hammered out and to design the wrap that will go on our truck! We can't wait to have these pictures to post for you! Once we have our logo, we can order our business cards and shirts and all the other great Kickstarter gear that you can receive by pledging to us! We have also ordered our commercial sausage stuffer and our immersion circulator. Those should be in within the next week, and we will start cranking out sausages and making our friends and family guinea pigs to taste test them! Seriously, we have received a few extremely generous pledges on Kickstarter, but we are not even close to our goal. Our first post about Kickstarter on Facebook was seen by 878 people. If every one of those people pledged only $5, we would be JUST short of our goal!!! $5 is a cup of coffee these days, and it would mean a HUGE difference to us!! If we don't hit our goal by November 16, we do not receive any of the pledges that were made. Please, please share our Kickstarter on your facebook page and tell ALL your friends, and pledge!!! I know that a lot of people are waiting until they get paid to make a pledge, but as long as you have your pledge amount available in your account by November 16, you don't have to wait! Your card won't be charged until that date, so please pledge now! If you haven't clicked on one of the three links above, here is it again! Getting off the ground...our Kickstarter campaign! 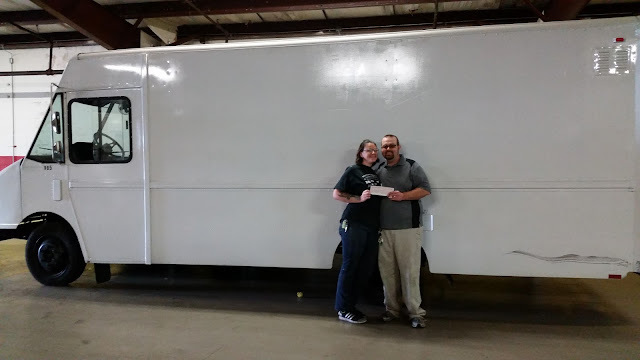 Once we have signed the loan, the check will be cut that day to Tom and Jen, and our truck will be next in line! We should have our doors open by the end of November, or early December!!! Are you freaking out? We are freaking out (a little)! We have lists and lists of things we need to get done before then, but thankfully we have amazing people helping us go step by step to make sure we get all the legal stuff done that we need to. We will be testing massive amounts of sausages, so we will be hitting up family, friends, and probably even random people to taste test them and give us honest feedback. We still can't do this without help, though! We have had so many people say that they wish they had a way to help, and now you do! We just launched our Kickstarter campaign TODAY! You can donate anywhere from $5- $1000, and there are rewards you will earn by helping us out on every level! You can get a meal on us, an amazing T-shirt with our logo on it, VIP passes to an exclusive Kickstarter party, a breakfast for you and friends delivered to your location of choice (in Jacksonville only), and even a sausage making demo!! 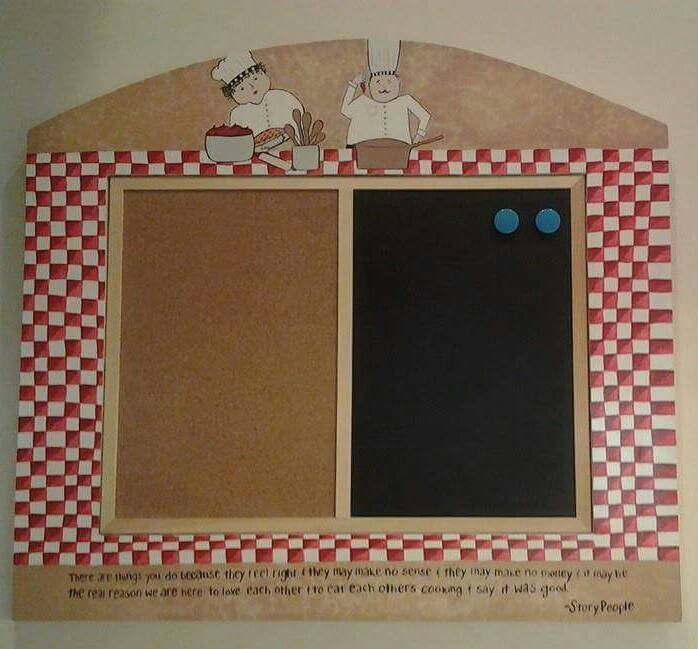 One of my favorite rewards, though, is that many of the levels include your name being added to our custom painted menu board! This is an example of one of the boards we have made, and ours will be similar, but the names will be added all around where the red and white checkered pattern is. There is one caveat to this campaign, though. If we don't meet our goal of raising $5000, we don't get ANY of it! So every little bit helps! We have 30 days to raise $5000! (If we do not hit this number, none of our sponsors cards will be charged, so don't worry about that.) Please go check out our Kickstarter page to see the full list of rewards, and help us REALLY take flight, and stay in the air once we do take off!!! We appreciate everyone's support, and have been so encouraged by all the amazing people surrounding us this far in our process! 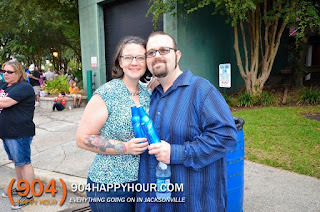 We cannot wait to show our gratitude by bringing Jacksonville incredible gourmet mini sausages! In case you didn't see the link above, here it is again!! We attended the Jacksonville Food Truck Competition at the Landing on Saturday, October 3. The turnout was absolutely incredible! There were so many people there that just walking up and down the rows of trucks was a daunting task. We mused that it will be SO much better next year when we can experience this event from INSIDE a truck. We had a fabulous time walking, scoping out the trucks and what they had to offer, their price points, and keeping a close eye on the quantity of people the trucks we able to turnover in set periods of time. It seemed in the amount of time we were there, that each truck had no less than 50 people in their lines at all times, and that they were pushing out that amount of orders in about a half hour. Ah. Maze. Ing! Certain trucks were definitely more popular than others, and we chose our food from trucks where we would not be in line with 100 other people. No joke. Some of the trucks had lines that long. It was a feat just to determine which line belonged to which truck, in some cases. "How pissed would you be if you got in a line, waited for 45 minutes, only to realize you were in the wrong line?" I can see how that could have happened at that event. 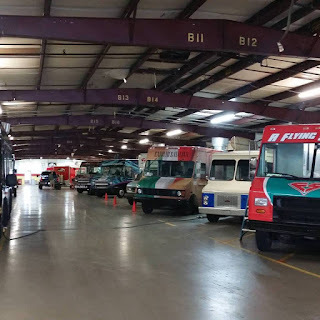 In some cases, we just chose trucks that we would like to follow and eat at in the future when they will be elsewhere and the wait won't be so long. To give you an update on our current progress, we have been approved for a loan. We are weighing our options on this loan, as it isn't nearly our original asking amount. We have a couple of people close to us that have jumped readily on board with helping us out financially, and we could get our doors open for what we have put together so far. What we have determined, though, is that we would feel much more comfortable with a cushion before we open our doors. We don't want to get the doors open, just to have to shut them almost immediately if something unplanned were to occur. Let's be realistic. That is always a possibility. We are in the process of starting up a Kickstarter campaign. To briefly describe what Kickstarter is for those unfamiliar, it is an online community that gives those with a vision a way to fund that vision. In our case, we will set up a page and describe what we are trying to achieve. We will set a monetary goal, and a time limit in which to raise that money. Friends, family, sponsors, or just anyone who thinks our idea is amazing and wants to help has the option to donate at their comfort level. In order for us to receive funds, though, we must meet our goal in the specified time frame. If we for some crazy reason didn't meet our goal, we would get nothing, and none of our sponsors would be charged for their pledge. Our pledge levels will start at $5 and go all the way up to $1000. Each level has a reward linked to it. For instance, if you donate $30, you will get a meal voucher, a mug with our logo that grants you free coffee for a year from our truck, a thank you card, and a shout out on all of our social media outlets. If you decide you would rather donate $50, you will get an invitation for two to join us for a VIP tasting event before we open our doors to the public. Have some real cash to spare? Donate $1000 and we will cater an event for up to 40 people for you, you will get to attend our VIP event, you get all of our "swag" (tshirt, hat, mug, sticker) and your name emblazoned on our custom painted menu board. We have the page set up, and we just have to put the final touches and make those last couple of decisions before we go live. 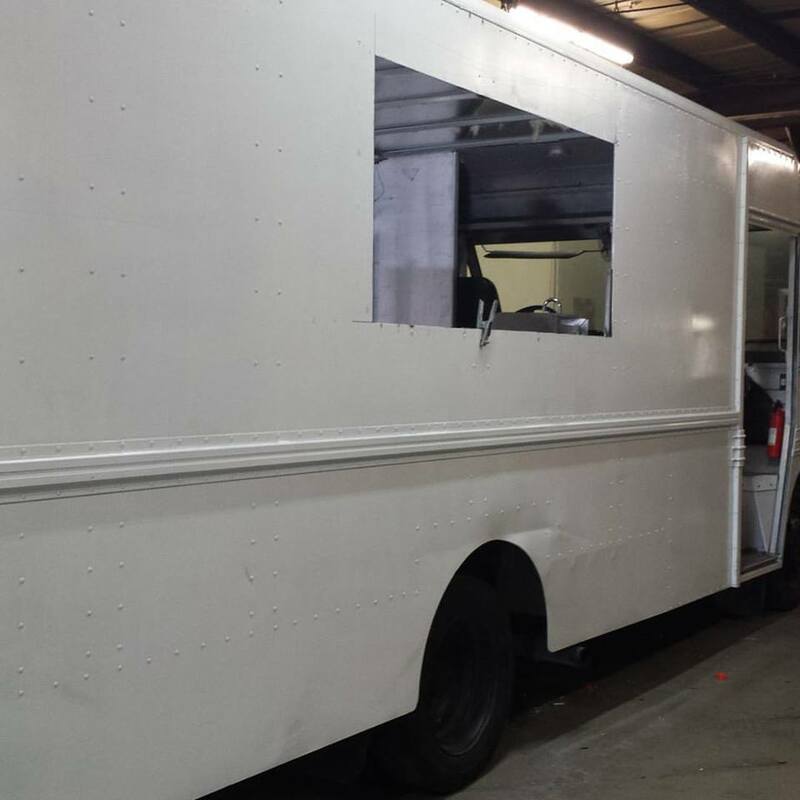 We cannot wait to join the Jacksonville food truck community! Please start considering if you would be willing to help us make our dream a reality, and get A Flying Sausage off the ground!!! Keep your eyes peeled for our Kickstarter Campaign coming VERY SOON!! "You did it...you made me WANT IT!" Many people have a TV show that they have watched so many times that they can quote it line by line. One of my shows is Everybody Loves Raymond. In one episode, Raymond's wife accuses him of being a pessimist when he gets nominated for a Sportswriter of the Year award. He swears he has no chance, and she tries to convince him otherwise. At one point he says in an accusatory tone, "You did it...you made me WANT IT!" 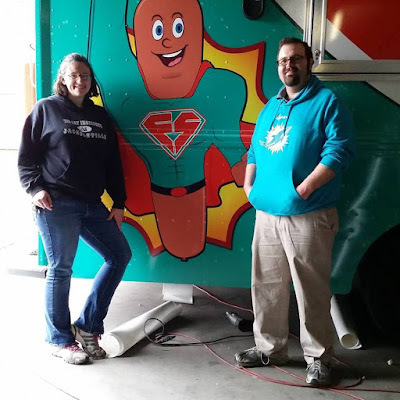 Yesterday we went to meet with Tom Wilbers and Jennifer Kline from Hot Mess Food Trucks to ask more questions and to have his eyes on the numbers portion of our business plan one more time before we committed to signing a loan for the truck. Tom and Jen wear many hats. Not only do they run three successful food trucks themselves (Up in Smoke, Pounders Burgers, and the newest addition to their fleet, Mystery Melt Machine), they run a food truck storage facility, secure and build out trucks for up and coming food truckers like ourselves, and are in the process of securing and building out a top of the line commissary kitchen. They have by far been the most helpful people we have encountered in this whole process, which says quite a bit because we have had the good fortune of meeting many, many people who are willing to go all in to help us get this dream up and running. After we got all of our questions answered, Tom told us he had already secured a truck for us and he took us to take a look at the truck. If you remember from a previous post, I talked about how I try to keep my expectations low so that I am not disappointed when they don't come to fruition, and am doubly excited if they do. Call it what you would like, a pessimist or a realist, when we saw the truck and climbed inside, I felt a little bit like Raymond. "You did it...you made me WANT IT!" I would say the closest I have had to this feeling was the first time I ever walked into the Art Institute, and saw my dream of going to culinary school that had been buried so deep inside of me for so long materialize in front of me. At that moment, I wanted it so badly it terrified me. That is the same feeling I got standing in front of that huge, beautiful (albeit empty) truck. Thomas is going today to respond to the bank that offered us a business loan. I think I'm as antsy as he is at this point. Keep your fingers crossed for us, and keep your eye on the sky for A Flying Sausage will be soaring there before long! !